For over twenty years, the players on the ProGrid Tour gathered every Friday night to lock in their picks on a parlay card betting game called the GridCard. This year, when the GridCard moved online, the GridCard Commissioner agreed to let everyone play--for free. 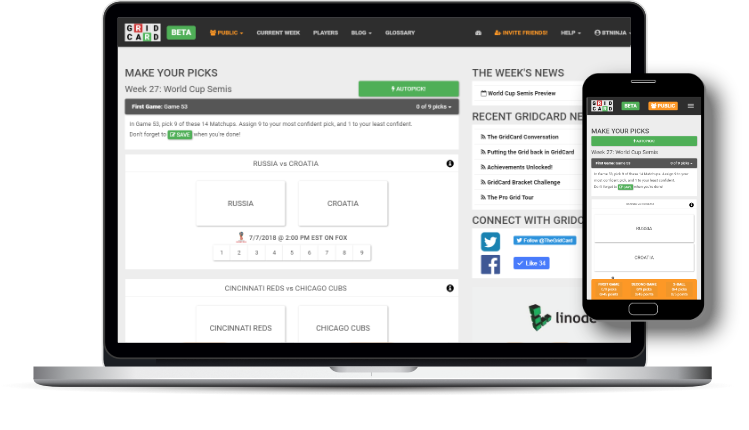 GridCard is a new way to play Fantasy Sports. It combines the thrill of competitive betting with the addictiveness of fantasy football, fantasy basketball, and fantasy baseball. Every day of the week, you'll have multiple games that you’re invested in. This game has been played for over twenty years, and during that time, it's been honed to an exciting science. You'll pick from 23 matchups for the week, from all major college and professional sports. Compete against the public, against the ProGrid Tour, and against your friends while you try to rack up the Achievements and earn a mention in the GridCard blog. Two games are played each week. Picks open every Thursday at noon EST and close at noon on Saturday. The First Game usually plays out on Saturday. The Second Game takes place Sunday through the following Thursday. In both games, you make nine bets and assign confidence points (1-9) to each bet. Winning bets earn points. A bonus 2-Ball TickerKicker section--four picks worth five points--adds play to the Second Game. Take a few minutes to pick your teams. Or use AutoPick and take seconds. Follow your name on the Leaderboard or click PGT in the nav to play against the ProGrid Tour. The GridCard makes every game you watch--count. Unlock achievements by playing GridCard. 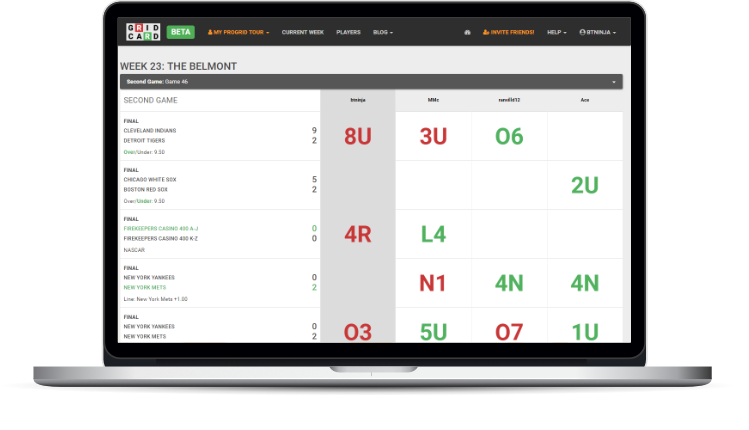 You’ll get all the Fantasy Sports excitement you can handle while playing to earn A Game Well Played, The King Kong, The Rise of the Machines, or the Ricky Henderson, among many others. 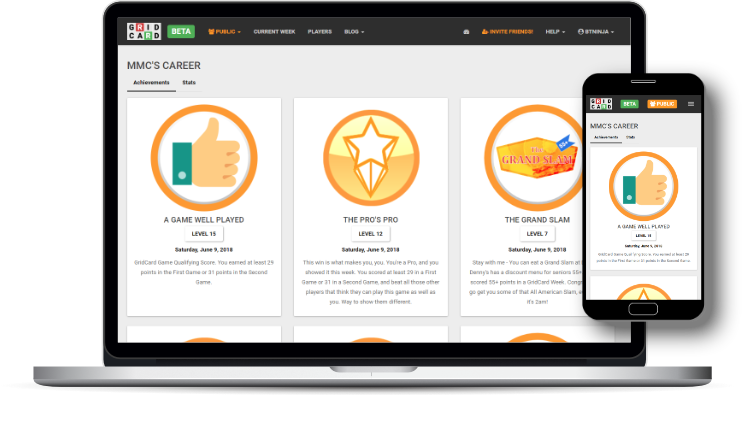 Once you’ve unlocked an achievement, keep playing to earn your way up the achievement leaderboard. Each time you unlock an achievement, you move up a level. There are more achievements coming all the time, so keep coming back for more! Fantasy Sports is more fun when you're playing with a friend. For every Matchup, you can join in on the conversation. Just click on the Conversation icon, choose from the phrases and images to share, and watch the game in a whole new way. You’ll find a way to use the 😎 when your team covers the spread on a last second, meaningless score, just as your competitors think the whole thing is a load of 💩. Don’t have time to pick all the games? Not sure who you would pick anyway? The AutoPick is for you? The Autopick will randomly and automatically fill in all your picks for you. The magic of GridCard is having action on all the games. Even if you don’t know the game when you auto-pick, you’ll know every day who you should be rooting for. Once you have a rooting interest, it doesn’t matter if you like the team or even the sport. Needing some random Wednesday night baseball game to swing your way for 9 points turns playing Fantasy Sports into something more like living Reality Sports. It’s a lot of fun to play against the public, but it’s a tough game to win. Invite your friends to play GridCard, then build up your own list of players. It’s easy, and once you do, you can filter the list of players just down to your group. 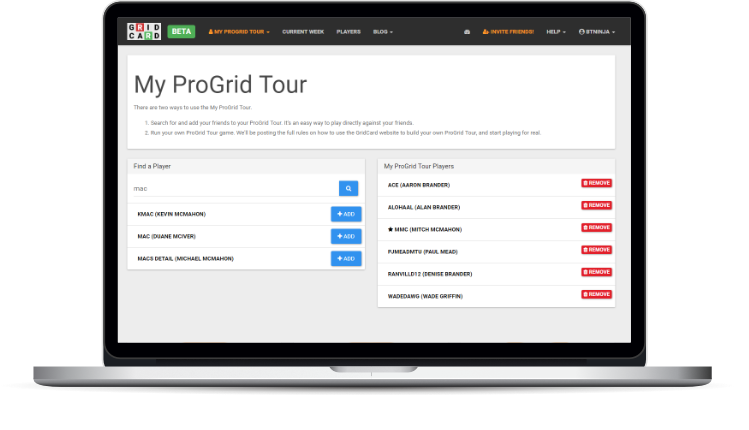 Challenge your friends for bragging rights, or put $10 on each week like the ProGrid Tour does. Either way, watching sports will never be the same again. So what are you waiting for? 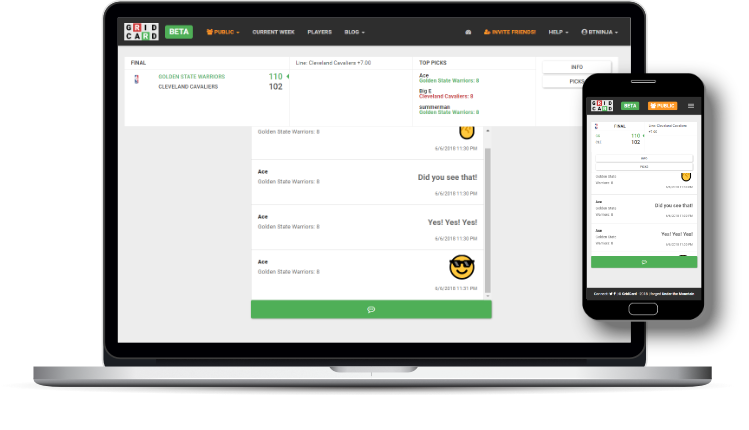 Join the Fantasy Sports Revolution, where you are no longer watching a fantasy, but living a reality. 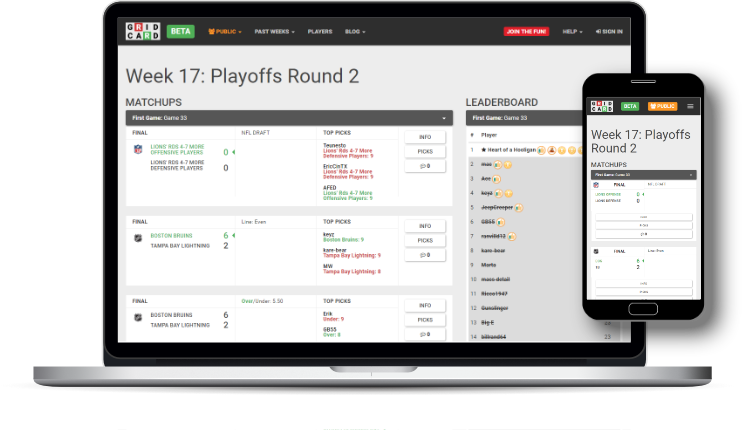 GridCard is the only free, weekly fantasy sports game that combines competitive betting with the thrill of fantasy sports.